Two master of education students from Aga Khan University discuss their Maker Day project assigned to them by UBC’s Susan Crichton during the Maker Days workshop in Tanzania. UBC Okanagan’s Maker Days has gone global. Maker Days debuted at the university’s Innovative Learning Centre last November, when educators from across the Okanagan explored how 'making' (designing hands-on problem solving) could become part of their everyday teaching. Faculty of Education Associate Professor Susan Crichton says Maker Days is part of the contemporary Maker Movement that encourages invention and prototyping—an intentional shift of the learning focus to innovation and exploration. It’s a grassroots movement that features experimentation and innovation across engineering, science, art, performance, craft, and education. 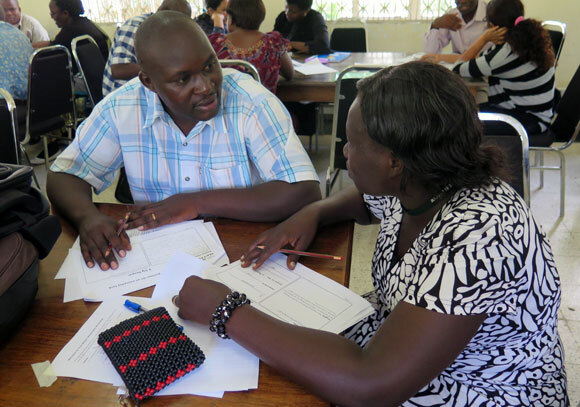 This summer, Crichton introduced Maker Days to educators in Dar es Salam, Tanzania where 82 participants, including local principals, administrators, and guests from the Tanzanian Ministry of Education, spent a day at a workshop with Crichton. All were introduced to design thinking, inquiry, and experiential learning through small group design challenges. Prof. Pauline Rea-Dickins, director at Aga Khan University’s Tanzanian campus Institute for Educational Development, says the Maker Day event was well received and she loved the buzz and excitement that filled the room during the activity sessions. Crichton was invited to facilitate the Maker Day, and funded the workshop with her grant from the Canada-Africa Research Exchange Grants program.